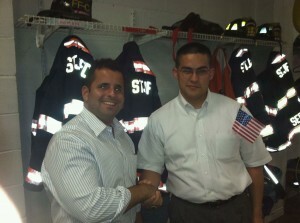 DANIEL ENEA, chairman of a 10th Anniversary September 11th Memorial Walk and Services held in Herkimer and St. Johnsville, met with Michael Hernandez, a representative for Assemblyman George Amedore (105th Assembly District), at the St. Johnsville Fire Department prior to the event. Amedore was a guest speaker. The event drew nearly 300 people between the two services, and succeeded due to the generosity of local businesses, people and organizations, according to Enea. "Seeing the outpouring of support truly makes me proud," he said. This entry was posted in admin on September 29, 2011 by admin. Adirondack League Club supports TOW Historical Assn. Recently, thirteen members of the Adirondack League Club presented the Town of Webb Historical Association with a series of checks totaling $3,400 to go toward the operation of the Goodsell Museum. This entry was posted in admin and tagged ALC, Historical Association on September 29, 2011 by admin. Priscilla J. Flynn (Zelie), 81, of Whitesboro, formerly of Syracuse, passed away September 25, 2011, at Faxton-St. Luke’s Healthcare. She was born in Old Forge, NY on January 10, 1930, the daughter of the late Wellington and Julia (Fetterley) Zelie. 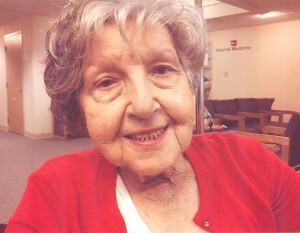 Priscilla was retired from St. Joseph’s Hospital in Syracuse, NY. She is survived by her children: a son, James (Shawn) Flynn of Syracuse; three daughters, Julia Tansey of Attleboro, MA; Melissa Flynn of Taberg, NY; and Melanie Flynn of Hogansburg, NY; grandchildren, Vanessa, Christopher, Katherine, Patrick, Victor, Brian, Tylar, Kateri, and Miguel; a great-granddaughter, Kimberly; and her sister, Margaret Ford of Whitesboro. Services will be held at the convenience of the family. There are no calling hours. Arrangements are in care of Dimbleby, Friedel, Williams & Edmunds Funeral Home, Whitesboro. Online expressions of sympathy may be left at: www.dfwefh.com. This entry was posted in admin and tagged Flynn, Obituary on September 29, 2011 by admin. If any image represents early Fulton Chain history, it is the Forge House atop the elevation overlooking the pond as a king viewing his realm. When the hotel burned in 1924, prominent citizens planned to quickly rebuild it but the era of the big summer hotel had ended, replaced by smaller, shorter stay motoring hotels. Today, we see a bank, motel, restaurant and a flat grassy knoll instead. But while the Forge House existed, the traveler was given the name of an individual there who would not fail to provide necessary comforts. This entry was posted in admin and tagged Charles Herr, Columnists, forge house, Herr-Story on September 29, 2011 by admin. It’s the end of September. I lived in Connecticut for the first forty-three years of my life. The weather would change, unpredictably so. Hot, cold, stuff in between the two extremes. And so the heating season begins, which causes much stress in this household due to no fault of mine. This angst was created, and is still owned by my dad who has been resting in peace for twenty-one years now. The reason he’s resting so peacefully? This entry was posted in admin and tagged Columnists, Jan from Woodgate, Mrs.Lucky on September 29, 2011 by admin. 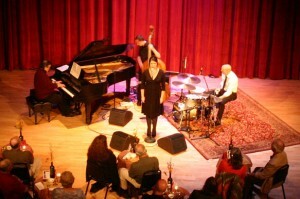 More than 100 people enjoyed jazz vocalist Jane Monheit and the Montalbano Trio who performed in “Bistro and the Gallery,” at View on Thursday, September 22. This entry was posted in admin and tagged monheit, montalbano, view on September 29, 2011 by admin. It was a warm morning as we exited the Inlet Elementary School for recess. All the boys ran like crazy for the playground for a game of kickball. 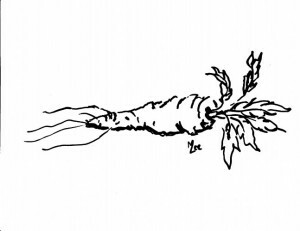 While we were picking teams we got a bit distracted when one of the older boys discovered a large patch of parsnips growing behind the school. He pulled a few of them up by their leafy tops. I watched as he rubbed off the dirt on the leg of his blue jeans and took a big bite. It wasn’t long before we all joined him in pulling up and eating those creamy white vegetables. This entry was posted in Columnists and tagged Columnists, Growing up Adirondack, Mitch Lee on September 29, 2011 by admin.